With the rapid development of industries and automobiles the noise hazard is increasing by many folds. According to American Academy of Ophthalmology and Otolaryngology excessive noise pollution can lead onto difficulty in communication, while at work and ringing sound in the ear for several hours even after work. Further some noxious agents also affect the workers in the industries. It is identified among the textile plant workers, basic metal industries, chemical industries, beverages, and nonmetallic mineral product industries. ,,, In this study, we conducted a survey of textile and metal rolling industries in our region to assess hearing loss in the industrial worker in relation to noise level, duration of exposure, age, and type of work in the factory. This study was conducted to evaluate the effect of noise pollution at work place and different noise scale in two industries, that is, textile and hard strip rolling at Bhiwani (Haryana) India. This study was conducted in 100 male industrial workers in age group of 19-55 years, which includes office workers, machine operators, and helpers. All underwent ENT examination and audiometery. The patients suffering from chronic suppurative otitis media, wax, deviated nasal septum, sinusitis, diabetes, and hypertension and on drugs known to affect hearing were excluded from the study. Audiometric testing was conducted in a sound free room in the office and calibrated digital audiometer ALPS AD 2100 was used. Hearing threshold were obtained for each ear at 250-8 kHz and a threshold above the 25 dB was considered to be hearing loss in any of the above frequencies. Patient details were charted on the Performa. Noise survey was carried out with the help of a sound level meter or decibel meter. This was a portable type and had "ABC" (GU) frequencies. It is battery operated and has range from 50 dBA to 120 dBA. We also measured various sound levels at office and machinery operated area. All data were analyzed statistically. A total number of 100 male industrial workers were examined by audiometery in the age group of 19-55 years. In the age group 19-25 years, there were 16 (16%), 26-30 years 16 (16%), 31-35 years 20 (20%), 36-40 years 18 (18%), 41-45 years 10 (10%), 46-50 years 10 (10%) and >50 years 10 (10%). Number of noise induced hearing loss (NIHL) was 02 (12.5%) in 16-25 years, 01 (6.25%) in 16-30 years, 10 (50%) in 31-35 years, 14 (77.7%) in 36-40 years, 02 (20%) in 41-45 years, 06 (60%) in 46-50 years, whereas it was 3 (30%) in age group of >50 years [Table 1]. We have included office workers, machinery operator, and helper group that include gardeners, sweepers, and peons. The total duration of service was 1-10 years in 24 workers, 10-20 years in 54 workers, whereas >20 years in 22 workers. There were no significant ear differences (right vs. left) across the age group. Total office workers examined were 22 who were working for 8 h, out of which 3 workers had mild 4 kHz notch, 1 moderate high frequency loss (HFL). Of a total of 46 machinery operators with 12 working hours, two had mild 4 kHz notch, 9 moderate 4 kHz notch, 3 moderate HFL, 04 severe 4 kHz notch, 4 severe HFL. Of 32 helpers with 12 working hours, 1 had mild 4 kHz notch, 2 moderate 4 kHz notch, 1 moderate HFL, 5 severe 4 kHz notch, and 3 severe HFL [Table 2]. Noise level at office was 64.8 dBA, at machinery area 87.3 dBA and at helpers area was 76.7 dBA at textile industry. The noise level in hard strip rolling was 69.4 dBA at office area, 90.3 dBA at machinery area, whereas 83 dBA at helpers area and was comparable in the two industries. Noise trauma causes bilateral SNHL that develops slowly over a period of several years as a result of exposure to continuous or intermittent loud noise at the work place. Generally, the first sign of hearing loss from noise exposure is a notching of the audiogram at 3, 4, or 6 kHz, with recovery at 8 kHz. In early stages of NIHL, the average hearing threshold at 500, 1, 2 kHz are less affected. Overall sound levels must exceed 60-80 dBA before a person will experience typical TTS even for exposure that last as long as 12-24 h.  The higher intensity of >60-80 dBA causes greater amount of TTS. The relationship between PTS and noise exposure at work suggests that such losses can occur under conditions comparable to those noted for TTS above, given long term and repeated exposure. Noise sound is composed of different frequencies within the audible frequency range. In general, noise having energy >1500 Hz is more potent in causing threshold shift than energy below this frequency. The duration of exposure in our study was 8-12 h daily, which is sufficient to cause noise trauma. High noise level exposure presents a great challenge to auditory system; however, continuous exposure of sound to the ears causes progressive damage to auditory periphery, or cochlea. A maximum permissible level of occupational noise limit by the international standards organization is 85-90 dBA for 8 h/day. In India, model rules under Indian factories Act 1948 stipulate a limit of 90 dBA for 8 h of exposure for 6 days a week. Most of the workers employed in the industries as skilled or semi-skilled workers are illiterate or semi illiterate having no information about the noise regulation and adverse effects of noise on their performance and health. The study of general adverse effects of exposure to occupational noise has been a topic of active research and debate among researchers. We have recorded maximum noise levels at machinery operated area when compared to helpers and office area. That is the reason maximum hearing loss was observed in machinery operating workers than helpers and office workers. The acoustic reflex is an important protective mechanism to the ears in response to noise exposure. The stapedius muscle is attached to the head of the stapes and is controlled by the facial nerve; the tensor tympani muscle is attached to the malleus near the tympanic membrane (TM) and is controlled by the trigeminal nerve. When both muscles are activated, the tensor pulls the TM toward the middle ear, thereby stiffening the TM, and the stapedius pulls the stapes almost perpendicular to the normal axis of movement in the oval window. Even though the planes of contraction are antagonistic, the action of the two muscles is complementary: their joint contraction decreases the transmission of sound through the middle ear by increasing the stiffness of the middle ear system. The attenuating action, however, is limited to sounds below 2000 Hz. 1. Bedi R. Evaluation of occupational environment in two textile plants in Northern India with specific reference to noise. Ind Health 2006;44:112-6. 2. Ravikumar A, Mohanty S, Senthil K, Raghunandan S. Evoked otoacoustic emissions to detect early noise induced hearing loss. Indian J Otol 2004;10:7-16. 3. Singh N, Davar SC. Noise pollution sources, effects and control. J Hum Ecol 2004;16:181-7. 4. Nelson DI, Nelson RY, Concha-Barrientos M, Fingerhut M. The global burden of occupational noise-induced hearing loss. Am J Ind Med 2005;48:446-58. 5. van Kempen EE, Kruize H, Boshuizen HC, Ameling CB, Staatsen BA, de Hollander AE. The association between noise exposure and blood pressure and ischemic heart disease: A meta-analysis. Environ Health Perspect 2002;110:307-17. 6. Kujawa SG, Liberman MC. Acceleration of age-related hearing loss by early noise exposure: Evidence of a misspent youth. J Neurosci 2006;26:2115-23. 7. Johnsson LG, Hawkins JE Jr. Degeneration patterns in human ears exposed to noise. Ann Otol Rhinol Laryngol 1976;85:725-39. 8. Ohrstrom E, Bjorkman M, Rylander R. Subjective evaluation of work environment with special reference to noise. J Sound Vib 1979;65:241-9. 9. Rao AB, Rao BN, Soodan KS, Kapur R. Study of noise environment and audiometric survey of technical airmen at various fighter bases in IAF. Med J Armed Forces India 1990;46:187-92. 10. Jaruchinda P, Thongdeetae T, Panichkul S, Hanchumpol P. Prevalence and an analysis of noise - Induced hearing loss in army helicopter pilots and aircraft mechanics. J Med Assoc Thai 2005;88 Suppl 3:S232-9. 11. McBride DI, Williams S. Audiometric notch as a sign of noise induced hearing loss. Occup Environ Med 2001;58:46-51. 12. Solanki JD, Mehta HB, Shah CJ, Gokhale PA. Occupational noise induced hearing loss: Is planning appropriate type of shift work for the workers the most practical potential preventive measure? Indian J Otol 2013;19:155-6. 13. Roozbahani MM, Nassiri P, Shalkouhi PJ. 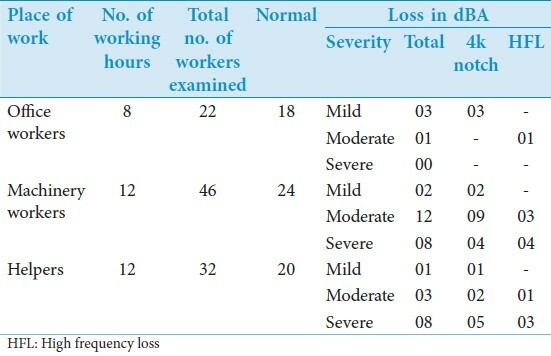 Risk assessment of workers exposed to noise pollution in a textile plant. Int J Environ Sci Technol 2009;6:591-6. 14. Passchier-Vermeer W. Hearing loss due to continuous exposure to steady-state broad-band noise. J Acoust Soc Am 1974;56:1585-93. 15. The factories act, 1948 (Act no. 63 of 1948), as amended by the factories (Amendment) Act, 1987 (Act 20 of 1987). 16. Zakrisson JE, Borg E, Lidén G, Nilsson R. Stapedius reflex in industrial impact noise: Fatigability and role for temporary threshold shift (TTS). Scand Audiol Suppl 1980;12:326-34. 17. Wallhagen MI, Strawbridge WJ, Cohen RD, Kaplan GA. An increasing prevalence of hearing impairment and associated risk factors over three decades of the Alameda County Study. Am J Public Health 1997;87:440-2. 18. Taneja MK. Noise pollution and civil laws. Indian J Otol 2004;10:3-6.